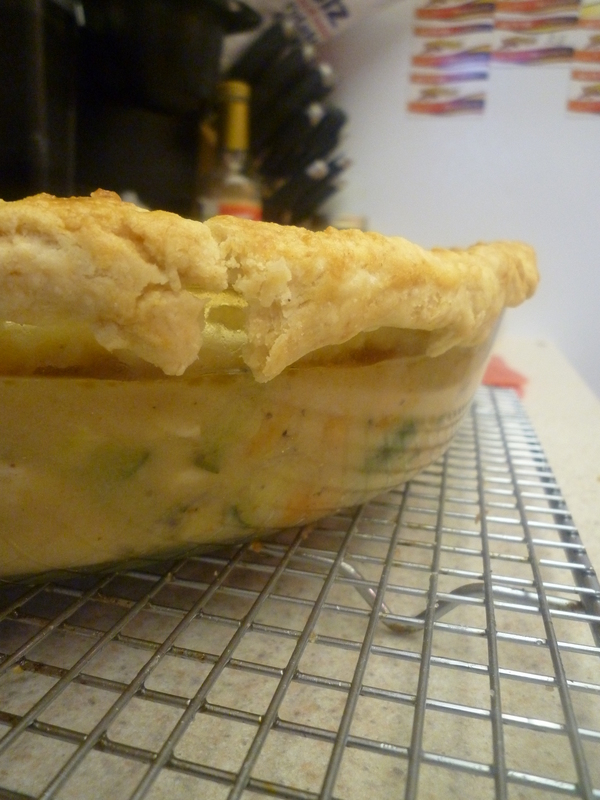 I can’t tell you the last time I had chicken pot pie, and no, I’ve never made one before yesterday. But soon after Chef Hall whipped up a might tasty looking one on Top Chef, I saw Alton Brown make his version on an episode of Good Eats. Ever since, it’s been calling to me like a siren. Juicy chicken and savory vegetables in a creamy, rich gravy tucked away beneath a buttery crispy crust. Yes, please. 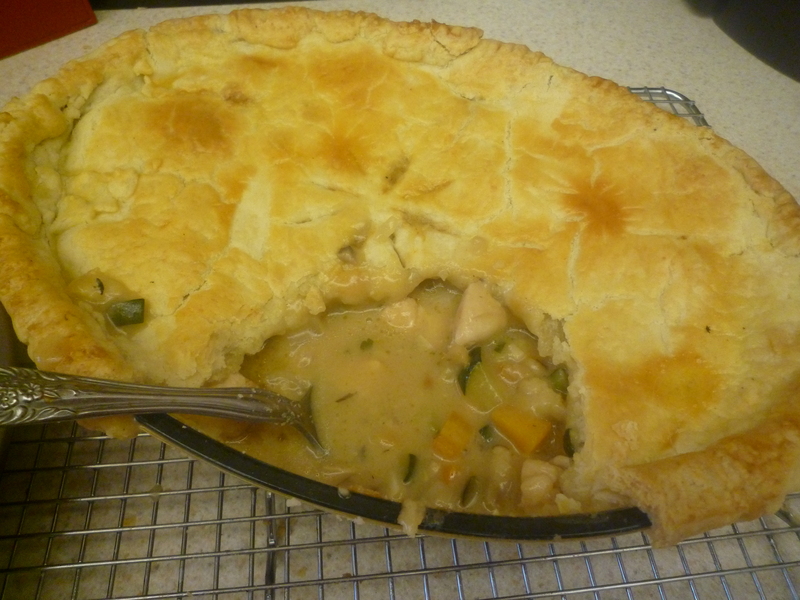 There are things about traditional pot pie of which I’m not a big fan. As much as I love chicken and potatoes together, I think there’s enough starch in the crust and gravy to suffice. Secondly, I cannot stand cooked peas. Maybe lightly steamed and shocked in ice water, but otherwise, no thank you ma’am. What I needed was a different green vegetable for both color and deliciousness, some earthiness, and something special to kick up that gravy. No sad, gray gravy here. First, prep the crust. I used a pretty basic pate brisee for this. 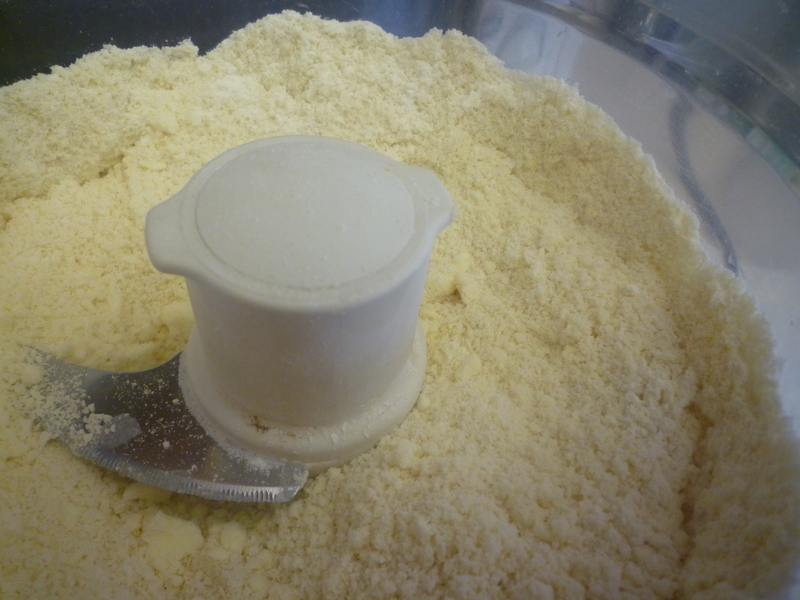 Just combine the flour, salt and sugar in the bowl of a food processor, and then slowly add in the butter and process using short pulses. The resulting texture should be sandy. Add 2 tbsp. of ice water and process just until the dough will hold together when pinched between your fingers. Add more water only if necessary and then roll the dough into a ball. Flatten the ball into a disc, wrap in plastic and refrigerate for at least 1/2 hour. 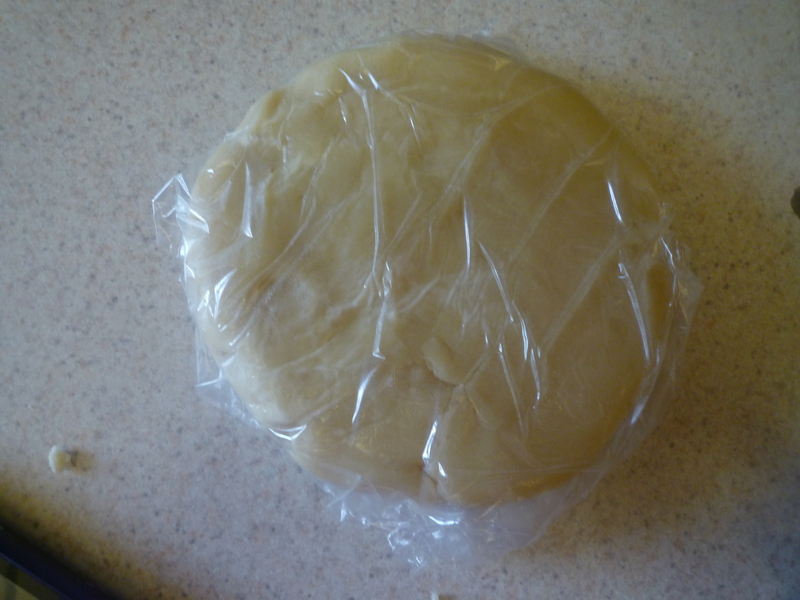 If you do this in advance, take the dough out of the refrigerator 20 minutes before rolling it out. 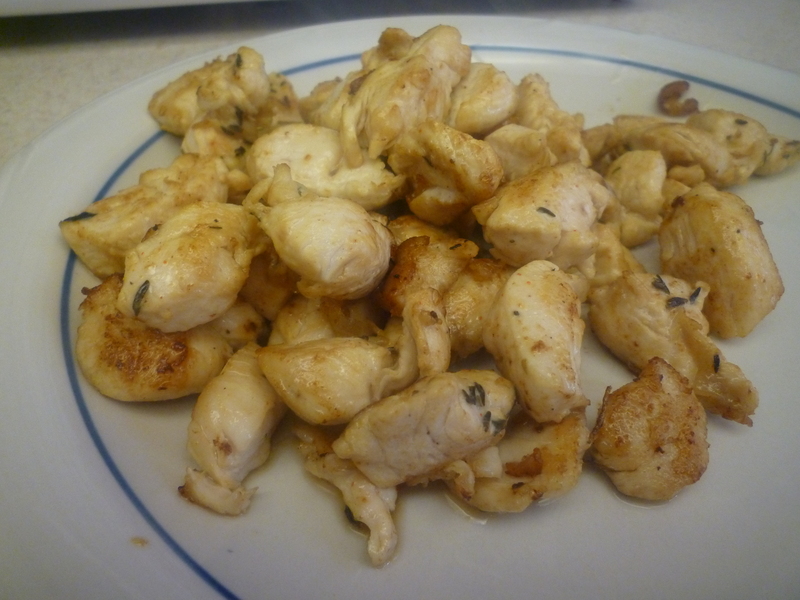 Toss the diced chicken with a little bit of olive oil and the lemon juice. Season with salt and pepper and then brown the pieces in a large pan. In a separate pan, warm the milk and chicken stock together over low heat. 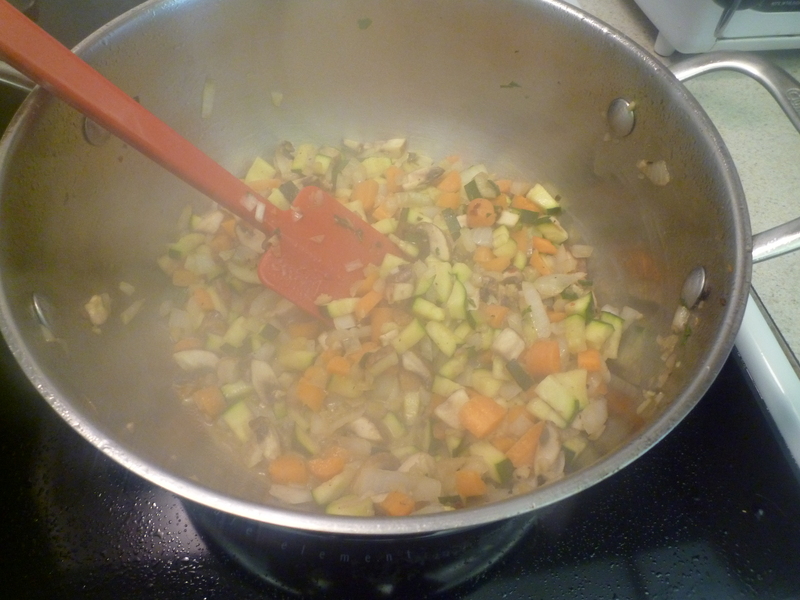 Add a small amount of oil to the same pan and sautee the onions, garlic, zucchini, carrots, and mushrooms just until they release their juices. Add the sherry and cook until most of the liquid has evaporated. Taste and season with salt and pepper to your liking. Add the butter, allow it to melt and then mix in the 3 tbsp. of flour. 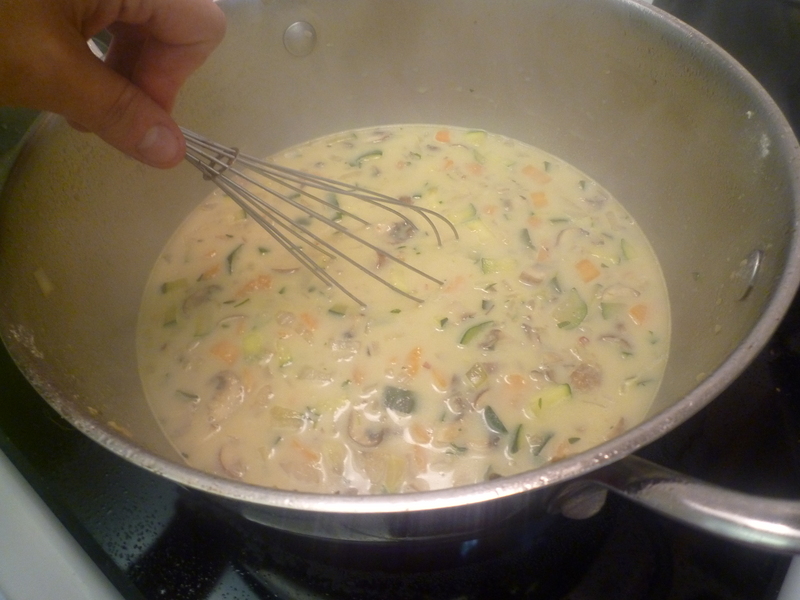 Slowly whisk in the milk/chicken stock mixture and then add the parsley, thyme, and red pepper flakes. 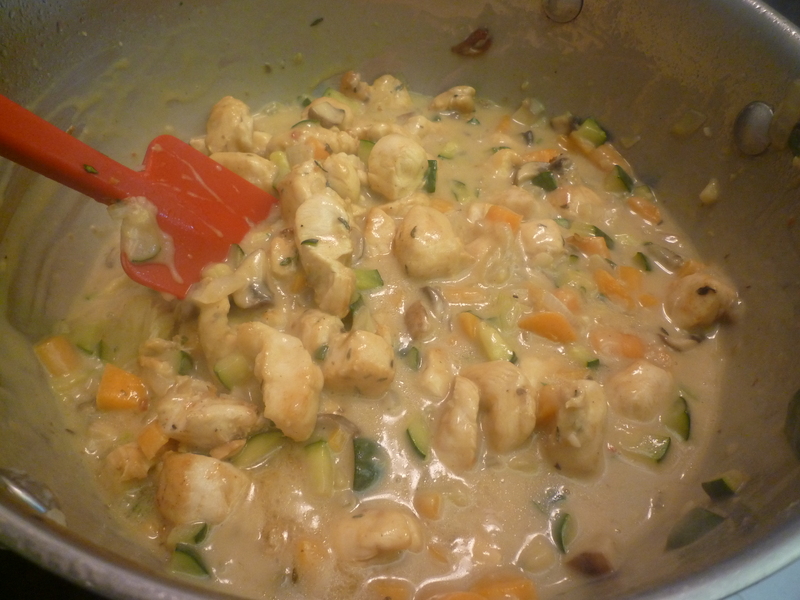 Cook until the mixture reduces and thickens. Remove from the heat and stir in the chicken. Pour the filling into a shallow baking dish. 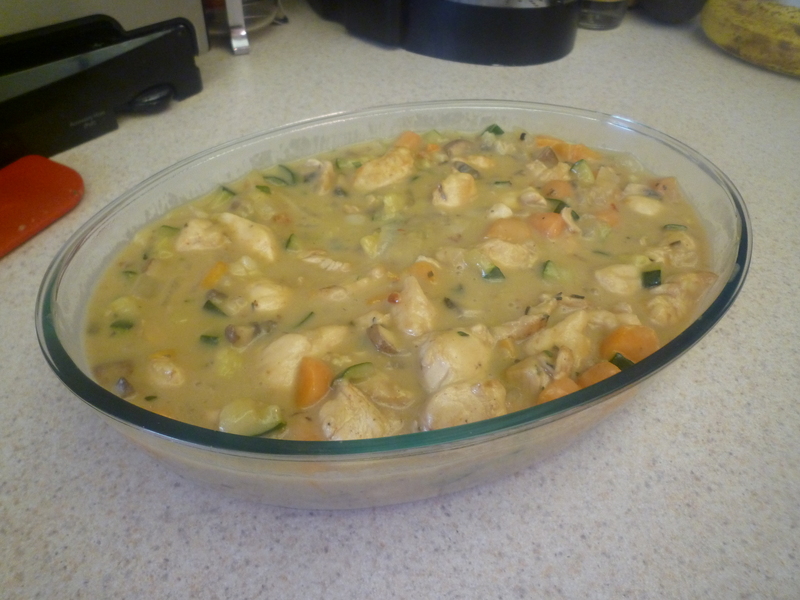 This 2 quart oval casserole dish was just the right size. A deep dish pie pan or 8 x 8 in. baking dish would probably work as well. 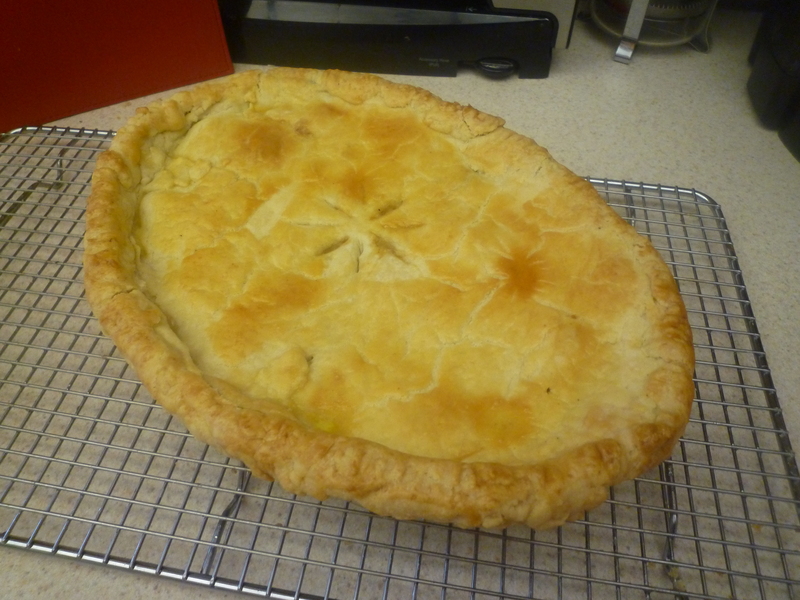 Roll out the pie dough to the shape of your cooking vessel, only slightly larger so that there is some overhang. 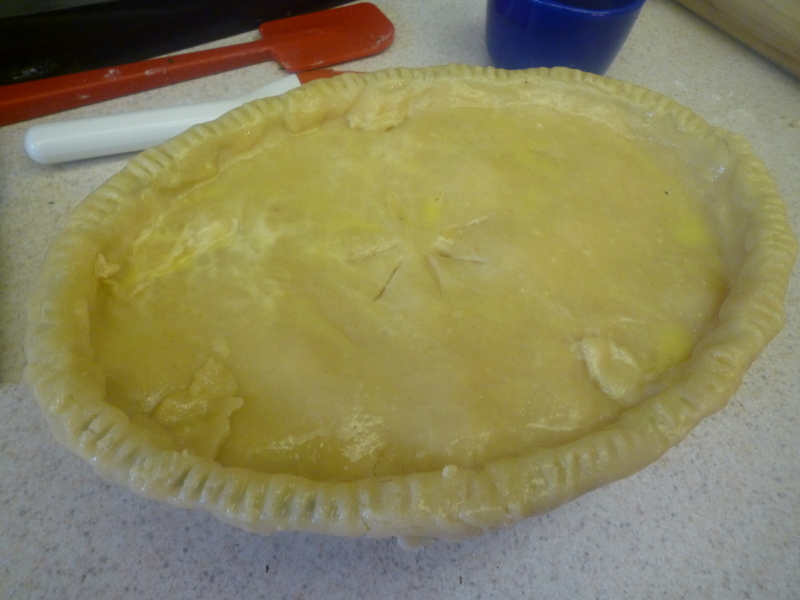 Cover the filling and crimp the crust along the edges of the baking dish to secure. Cut some vents in the crust to let out steam, and then brush it with the egg wash. Allow it to cool for 10-15 minutes before digging in. Eat and be comforted. Hope you all have a great Memorial Day weekend! Hey, I just jumped here from a link in Goons with Spoons and had to say this looks amazing. I too craved pot pie after seeing Carla Hall make hers on Top Chef, and your recipe looks fantastic — zucchini instead of peas works for me! I’m definitely going to try this when the weather is cooler. I always have trouble with chicken — when you brown the chicken, do you leave it somewhat undercooked so it doesn’t get tough during baking, or does it not matter? Thanks for the compliment! I didn’t worry about cooking the chicken through when I browned it since I knew it would be in the oven for awhile. You can also toss the chicken in the lemon juice/olive oil a few hours prior to cooking, and the acid will tenderize the meat. Good luck–hope you enjoy it.